Russian folk show at the Nikolaevsky Palace. A visit to Nikolaevsky Palace is a good chance to get acquainted with the history and culture of Russia. The third son of Russian Emperor Nicholas I moved to the palace at Annunciation Square with his wife Alexandra Petrovna (the princess Frederina-Wilhelmina of Oldenburg) in 1861. By the middle of the 19th century the site where the palace was constructed had been turned into a highly fashionable area. The design for the palace had been submitted by the famous architect Andrei Stakenschneider and it was considered the best one. The mixture of architectural styles used for the decoration of Nikolaevsky Palace doesn’t make it too overloaded. On the contrary renaissance, baroque and classicism come together to reveal a perfect harmony. The magnificent staircase welcomes guests and introduces them to the homely atmosphere of the palace. Following the ancient Russian tradition of hospitality the hosts greeted their guests on the top of the gala staircase with Bread and Salt. The entrance to the family Church of Our Lady of Sorrow is located right on the gala staircase. Nikolay Nikolaevich was fond of Russian culture and the Russian tradition of hospitality. He often organized balls and receptions in Russian style with graceful and historically authentic costumes. 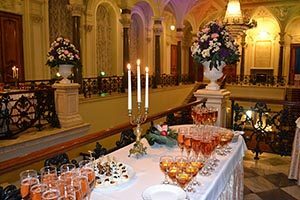 The program of each ball included celebratory dinners based on traditional theme dishes supplied with cranberry, cloudberry, currant and mushrooms. After the ownership of the Palace was handed over to the Ministry of the Imperial Court, it then became an institute for the education of middle-class women. The last graduation happened in 1918. Since 1918 the local Trade Unions’ association has been located here and the Palace acquired another name- the Palace of Labour. (Dvorets Trouda). These days it is a tradition to have Russian style performances at the Nikolaevsky Palace. 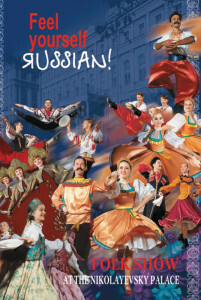 The ‘Feel Yourself Russian’ Show welcomes guests with joyful folk performances and exquisite cuisine. Two shows are available: at 7 p.m. and at 9 p.m.
Each show consists of two 45-minute parts, and lasts for 1 hour 50 minutes. vodka, champagne, mineral water and juice. Peter's Quartet: A classical quartet who play a mix of folk songs, lyrical melodies and Russian Orthodox hymns. A Cossack song-and-dance group who reproduce songs in their original form on stage. The group is called Maidan and is named after the place where Cossacks used to assemble in olden times and where important political decisions were made. The Stars of St. Petersburg, a group who demonstrate dances from across the length and breadth of Russia. These range from the lyrical dances of the Russian North, to the frightening dances of the Don Cossacks from the Don, to the subtly humorous dancing miniatures of the Urals and Siberia. The professional performers of these three folk groups convey Russian national colour on the stage with the highest skills, complex acrobatic feats and breathtaking leaps.